You’re ready to say, “Take this job and shove it!” But before you do, think about whether toughing it out a while longer might bring you a greater reward than the satisfaction of walking out right now. It’s often said that if you’re not happy in a situation, you should move on. But there are good reasons why quitting in the heat of the moment might not be such a good idea. Here are our top 3. Are you financially prepared to support yourself while you look for another job? In today’s economy, that could take a long time. It might be better to wait a while and save up at least 6 months living expenses before you take the leap. The bad vibe might be temporary. Do you want to get out because of a conflict with a superior or co-worker? Consider that people frequently move around to different departments or branch locations within a company, so this person might not be your problem for very long. Or maybe you want to jump ship because the company isn’t doing well and employees’ pay is suffering as a result. This could turn around as the economy improves. You will have thrown away the opportunity to grow and rise within the company, for a reason that disappeared soon after you left. It doesn’t look good on your resume. Especially if you’ve been with the company for less than a year, leaving now will give potential employers the impression that you’re a job hopper — NOT what they’re looking for. Another thing you should know is that recruiters tend to prefer job seekers who are currently employed, over those who are out of work. We at Integrity Staffing Solutions don’t believe this is fair or justified, and we don’t practice it in our hiring process, but it’s a well known statistic in the recruiting industry. Given that your resume will be with you for life, sticking with this job a few more months could pay big dividends in the long run. 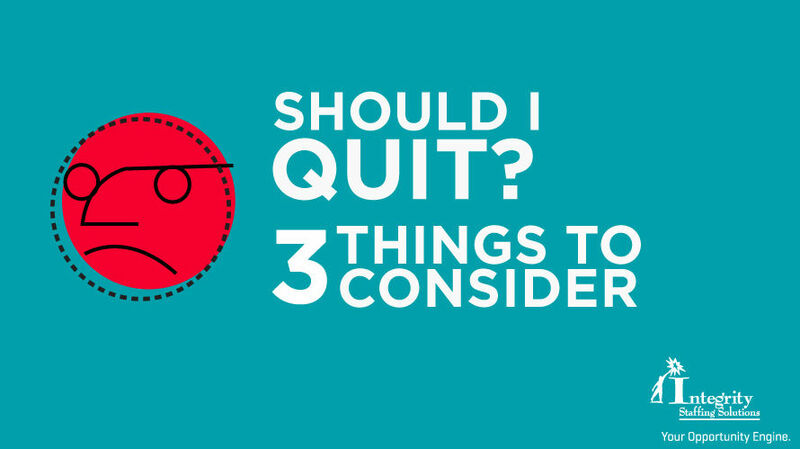 There they are, 3 big reasons why you should put your emotions aside and think carefully before you hand in your resignation. Whatever your issue, there may be ways that you can reshape your job description, resolve or distance yourself from interpersonal conflicts, or simply wait out the bad times. You might end up saying — someday in the future when you’re sitting in your executive suite — that this job was the best thing that could have happened for your career!